Black Mustard Seeds are less mild and more pungent than the yellow variety. They have a savoury, tangy and pungent spicy taste. Black seeds are used particularly in Indian, African and German cuisine due to its heat flavour and appearance. They are a key ingredient in the Indian blend Panch Phora. The spice people carry these mustard products; mustard seeds black, mustard seeds yellow and mustard powder. Mustard Seeds black are less mild and more pungent than the yellow variety. They have a savoury, tangy and pungent spicy taste. 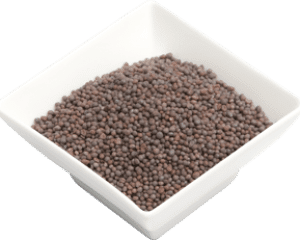 Black mustard seeds are used particularly in Indian, African and German cuisine due to its heat flavour and appearance. They are a key ingredient in the Indian blend Panch Phora. Can be used in pickling agents for preserving various different vegetables. Add a spicy warmth to chutneys, relishes and sauces. Combine with lemon juice, tarragon or vinegar for a salad vinagarette. Mustard is a good source of omega 3, minerals and have many health benefits. It contains iron, calcium, zinc and magnesium. Other names or spelling: brown mustard seeds, black mustard seeds, Yellow Mustard, Brassica alba, Rai, Lal sarsu, White mustard, Brassica hirta, brown mustard, Brassica juncea, black mustard, Brassica nigra, black mustard seeds.